A “Place” in the Queen City. As an urban designer and planner, I’m always excited to return to my home city of Charlotte to witness the “next big project.” I recognize that a city is always changing and evolving – it’s a living organism – but the urban core of Charlotte has transformed drastically, possibly faster than any other major city. Perhaps it’s because I long to return to my beloved Queen City and I’ve gotten a bit nostalgic, but there is a noticeable and excitable shift in the urban core of Charlotte. It has become a true place, or shall I say, series of places, that makes a unique and livable city. Development for development’s sake is one thing. If we look around our built environment the change in the urban form over years in many places is too drastic to even document. Subdivisions, apartments, retail centers all sprout up in cities across America, often without any discernible meaning. Development has its benefits, such as an increase in tax revenue, affordable housing, and neighborhood services to name a few, but the real achievement is encouraging investment through placemaking. In my opinion there is no better investment than one in public space. The direct and quantifiable correlation between public and private investment is a difficult one to prove – but there is no doubt that in the right place at the right time investment in public spaces can create immeasurable socio-cultural and economic value for a city. 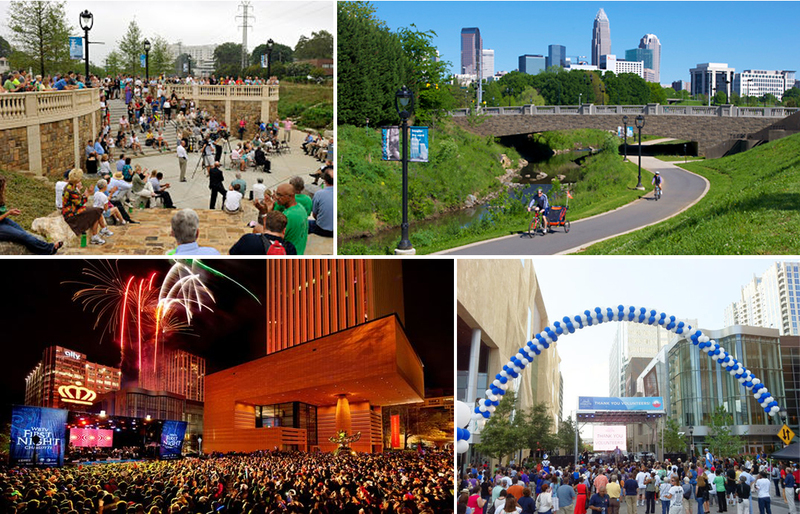 The center city of Charlotte has benefited recently from huge investments in the public realm: The Levine Avenue of the Arts and the Little Sugar Creek Greenway, albeit very different in their purpose, are just two that contribute to a growing network of public spaces. 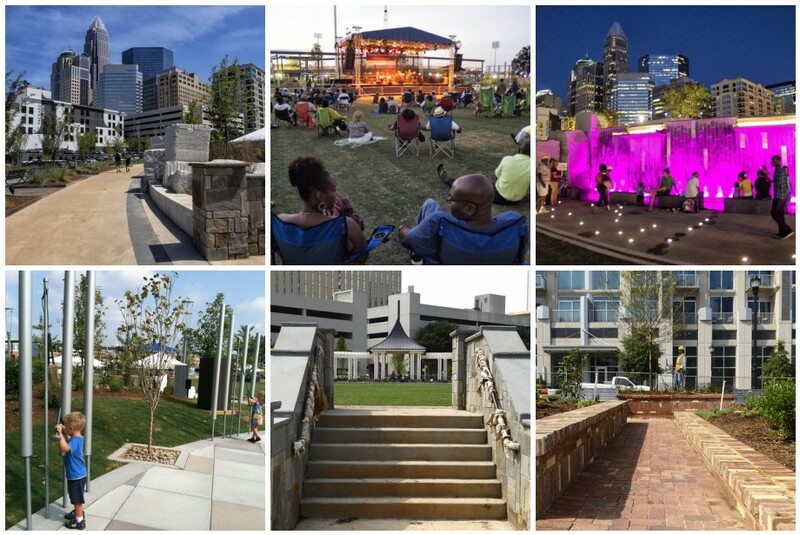 The most recent gem, however, is the newly opened Romare-Bearden Park, a public park in Uptown Charlotte that offers a finely-tuned symphony of places in one public space. Uptown Charlotte, like other cities that flourished during the heyday of the automobile, has long suffered from the thief of urban life: the surface parking lot. Of all the neighborhoods in Uptown, the Third Ward has endured the longest. Most recently an entire block of surface parking was transformed to one of the best urban neighborhood parks I have witnessed. 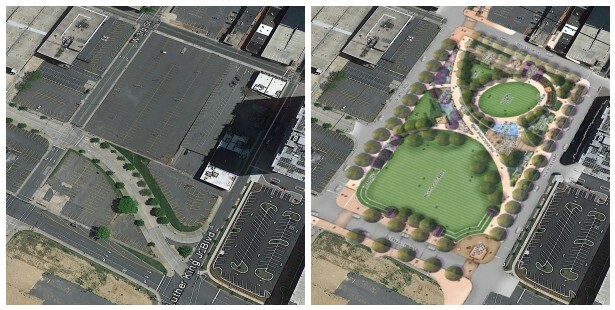 What made this special was that the urban designer was able to transform an entire city block, not just into a park, but into a series of places for people. This was the exact same experience I had in my first journey through Romare-Bearden Park. Romare-Bearden is a series of unique places, each offering a different experience, organized along a continuous spine that meanders from one side of the park to another. A large green for events, a children’s interactive area, an herb garden, a more intimate courtyard with pergola, a formal sitting area, an arbor, and at the center a dynamically lit waterfall, all make this park usable by many different people for a variety of purposes at all times of day. 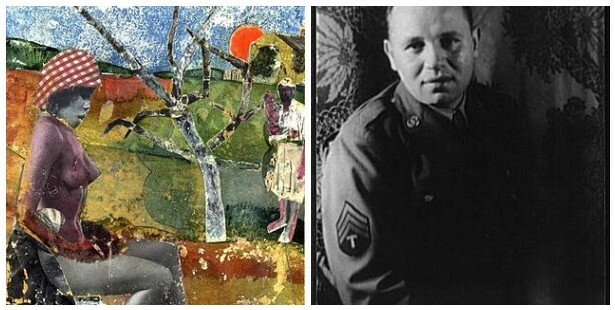 Please check here for more information about the themes and experiences of Romare-Bearden. Just walking through this park on any given day, you will find a diverse group of people using these spaces in different ways: kids playing tag and throwing the football on the green, small children playing the chimes and dancing in the water, people sitting at a table having lunch, or a couple meandering through the garden. The change in elevation hides the spaces from one another, so that each of these activities feels intimate and special. People spending time in such a place is the catalyst for the success of an open public space. Romare-Bearden is becoming the community gathering space for the growing population of residents downtown. A Physical Connection – The Evocative Spine is oriented to connect the linear park from S. Tryon and the orientation of the spine from The Square (intersection of Trade and Tryon Streets). This serves as the distinct center of the urban core with Bank of America stadium, the newly constructed BB&T Ballpark, and newly constructed multi-family residential development. One of the challenges in keeping a large public space safe is maintaining robust citizen activity. By accommodating and enhancing a natural and heavily used pedestrian route through the park, the public space becomes more relevant to its users. Elements like the cascading linear steps along the street and a linear promenade connecting the park with Tryon Street integrates the public space and Third Ward with the entire urban core. Our Heritage – The entirety of the design is themed and routed in Romare Bearden, an African American artist and writer born only blocks from the park. Educated and practicing in both New York City and Paris, his work was rooted in his Southern identity. The honoring of a great legacy to the city through public space provides the opportunity for citizens to be aware and to connect emotionally with their heritage. Sense of Place – The journey along the Evocative Spine is anchored constantly by overarching views of the skyline, perched perfectly in the users’ cone of vision. 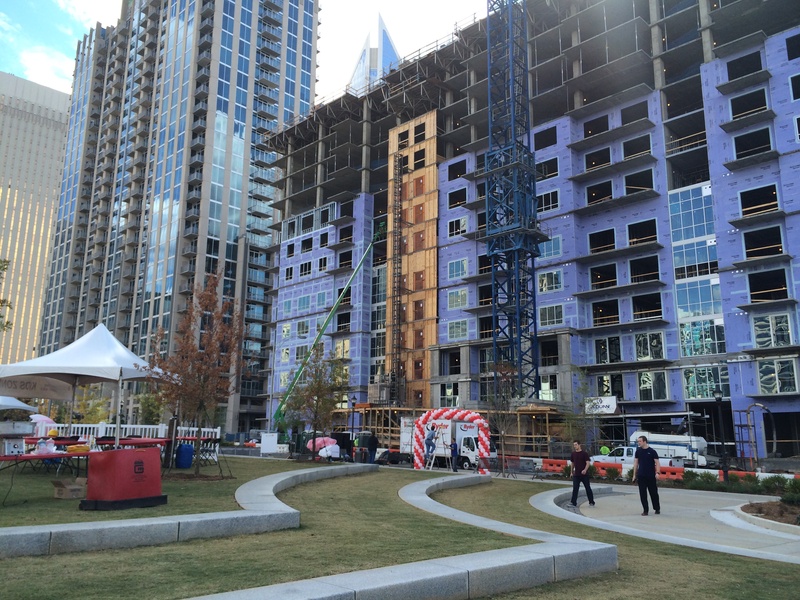 When you are in Romare Bearden Park, you are constantly reminded that you are in the center city of Charlotte. Enhances the Senses – Experiencing Romare Bearden Park is enhanced by all of the senses: the cascading water on the skin, the scent of herbs, and the bright colors of flowering plants. Natural materials and local plants enhance the identity of the public space. Above all else, the constant element of “play” experienced by dancing and playing the chimes in the Muse Area and climbing on the boulders that frame each unique space creates constant fun! 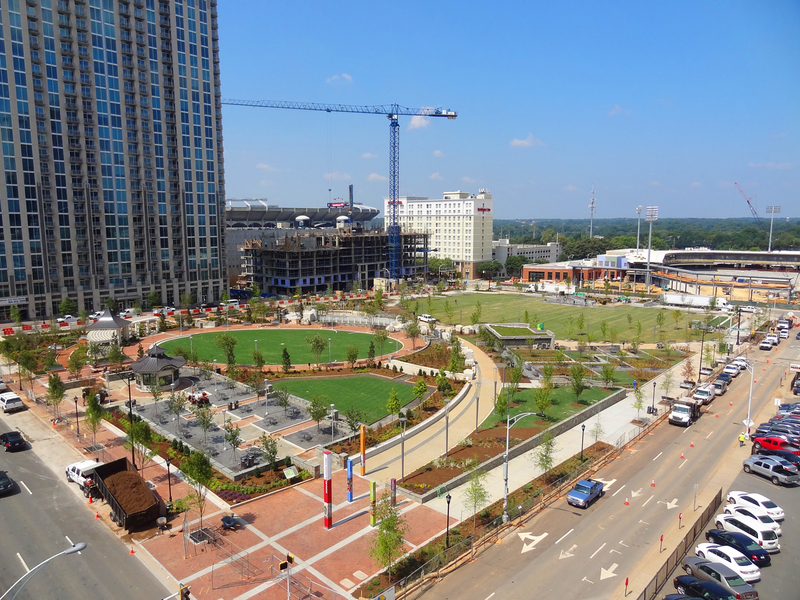 The Romare-Bearden Park achieves a true sense of place in a growing center city neighborhood that endeavors to establish an identity – perhaps more than any other part of the urban core. The investment in public space not only has been instrumental in attracting private development and bringing more residents downtown, it will also serve as the “living room” of a growing community and will enhance the growing network of public spaces in the center city. As a native Charlottean with roots in the city that span over seven decades, I am ecstatic by the commitment of resources to transforming our urban core into a true place that continues to build the identity of the city locally, regionally, and nationally, as a livable and walkable city. The Calabash Collage (1970), Library of Congress. Romare Bearden.